Many of us are looking for simple solutions to make meals that are quick, affordable, delicious…and, if possible, healthy. This recipe for mini frittatas will become a staple at your house if you’re looking for any of those things! It’s great for breakfast or brunch and is super kid-friendly, too. Loving all of our fresh ingredients! 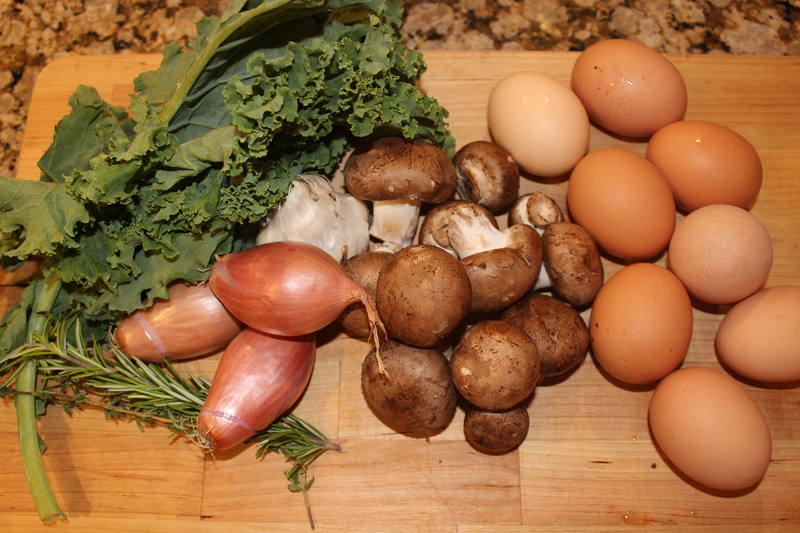 This recipe includes a variety of super healthy foods, including kale, mushrooms and shallots. As I’ve written before, kale is a superstar vegetable and one of the healthiest foods we can eat. Mushrooms and shallots also have tons of health benefits, including being potent cancer fighters, like other anti-cancer, anti-fat storage GBOMBS foods. We get our eggs from Hometown Harvest, and they’re from pasture-raised chickens that aren’t crammed in pens and injected with a bunch of antibiotics like most chickens. The eggs are delicious! 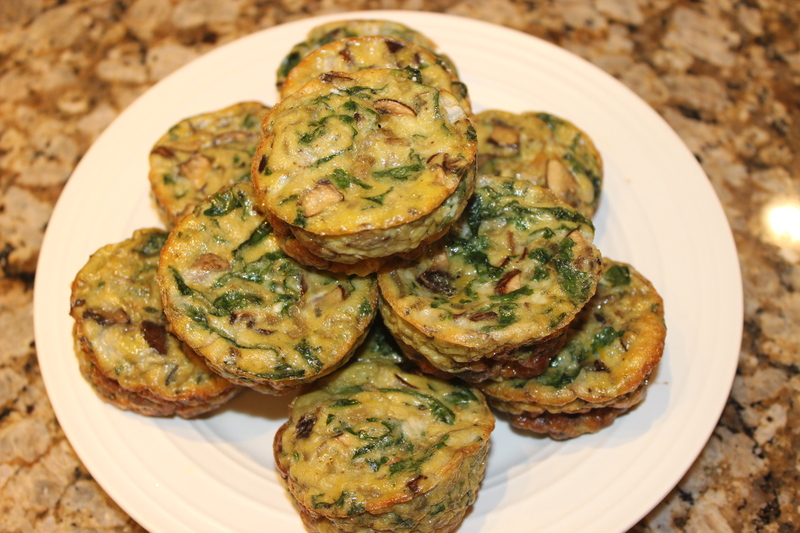 I ended up with 12 mini egg frittatas (make a double batch to save time if you want!). You could easily make this on a Sunday and have them for the week for meals. These should keep in the fridge for 3-4 days, or you can wrap each one individually in plastic wrap and foil and store them in the freezer for a few weeks. I find that reheating them in the oven or toaster oven works best so they don’t get rubbery, but you can try reheating in the microwave, too. From frozen, try 30-60 seconds and from the fridge, try 15-20. YUM! These mini egg muffins are bursting with flavor and SO yummy! Preheat oven to 375F and coat the muffin tins with a thin layer of coconut oil to prevent sticking. In a medium skillet (we used a cast iron skillet), saute the shallots until translucent. Then, add in the garlic, mushrooms and herbs, and saute until the mushrooms start to shrink (4-6 minutes). Add in the kale, tossing it until it starts to wilt. Turn off the heat and set veggies aside to cool for about 10 minutes. Whisk the eggs together in a medium bowl with the coconut milk, salt and pepper. Stir the cooked veggies in with the eggs and pour the mixture into muffin tins, filling each about 75% of the way to allow room for puffing up. Cook for 20 minutes, flipping and rotating the tray halfway through, until the muffin edges turn golden. Let cool before serving. They will puff up during cooking and shrink down once cooled. ENJOY! Pro tip: you can use less oil and save yourself hours of scrubbing if you use a silicone muffin tin. They practically pop right out! Hi Rachel! Your blog is great:) I love the idea behind this recipe but I am very unfamiliar with coconut milkoil for cooking. Can you tell me if it changes the taste at all or if I could use a substitution? Hi, Brietta! Thanks so much! Great questions. If you get unsweetened coconut milk in a can (full fat version), it won’t give the food a coconut taste – it just adds richness to the dish. Also, I haven’t found that these have a coconut oil taste when I coat the pan with coconut oil. I make sure to get unrefined, extra virgin coconut oil. They sell it online, at natural food stores, a lot of grocery stores, wholesale clubs like BJs and even at Home Goods (not sure if they have those where you are!). I used to HATE coconut and now I like it, so I’m probably more sensitive to the coconut taste than most people, and I don’t notice the taste when I use it the ways this recipe calls for. Can you advise how many muffins this recipe makes? 12/18/24? Hi, Kathy! 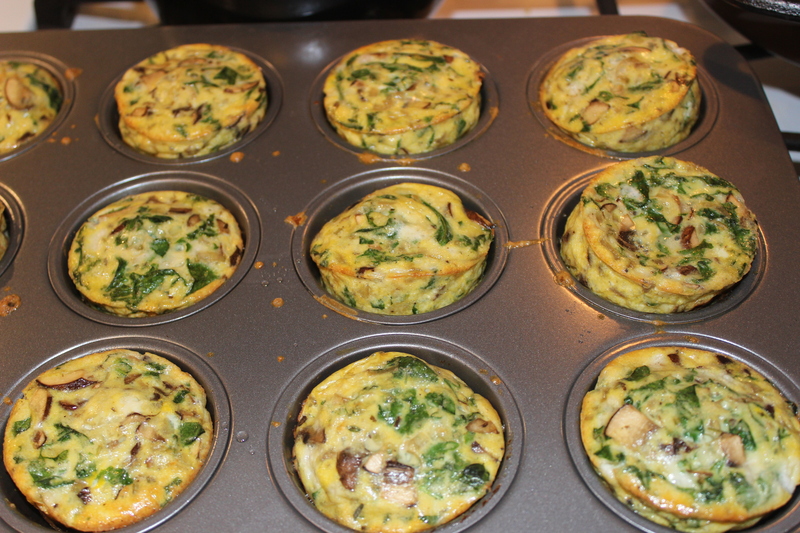 It made 12 regular muffin-sized frittatas. Hope that helps! They were delicious. I did have to substitute a little. I froze them and now pull 2 or 3 out for a nice breakfast treat! Hey honey. I might make these for the upcoming Children’s Camp at church for the disabilities ministry the weekend of the 20th of June. They need people to make meals—breakfast and dinner. Thanks for this! You’re welcome! That sounds like a good idea 🙂 We just made them again this week! I made mine with sausage and kale, can’t wait tip they cool! Got the thumbs up from tiny and I will be making another batch this weekend! We are hosting a wedding shower brunch. I am wondering if you have any good ideas of how to make ahead of time and keep them warm? Do you think they would be ok if we cooked them and then placed them in a large roaster with a piece of tin foil on the bottom of the roaster. Or, do you think they would get soggy? Thanks in advance. Hi, Rachel! Great question. We refrigerated them for 2-3 days after making them and just heated them up either on a skillet on the stove or in the toaster oven each time we wanted one, and they didn’t get soggy. I would imagine if you put them in a large roaster that they would be okay, as I didn’t find them to be terribly watery. I think the coconut milk helps with that as well as the bulk from the other vegetables. I can’t promise it will work, since I haven’t tried it myself, but I would feel comfortable trying it. Let me know if you end up doing it and if it works out for you!